Find My Shower Curtain in International Quilt Festival Quilt Scene magazine! What an exciting surprise! There I was sitting in the airport waiting to leave Houston after an exhausting week at Quilt Market. 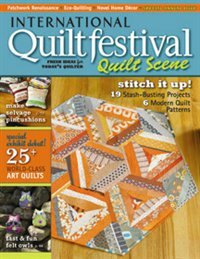 I opened my "International Quilt Festival Quilt Scene" magazine that was given to me by Interweave press and right on page 92 was my Quilted Shower Curtain. It is so much fun to have my projects published, and of course it's not bad to see your name published in a magazine either. If you don't have your copy yet, run out and buy one. This is the special 2nd annual issue and there are 140 pages of projects inside.